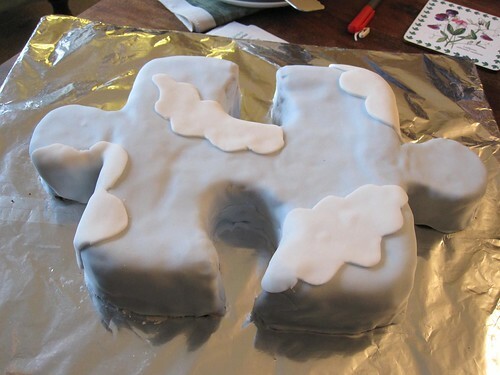 After a bit of to-ing and fro-ing, establishing that he actually wanted a jigsaw piece-shaped cake and not a crossword cake (he’s a big fan of both types of puzzle), I set to work. I picked a chocolate cake recipe from my rather battered and batter-smeared copy of The Complete Book of Baking, multiplying it by half and throwing in a tub of Waitrose “Cooks’ Ingredients” fudge chunks for good measure (recipe at the bottom of this post) and baked it in a square tin. Finally, the sugarpaste. 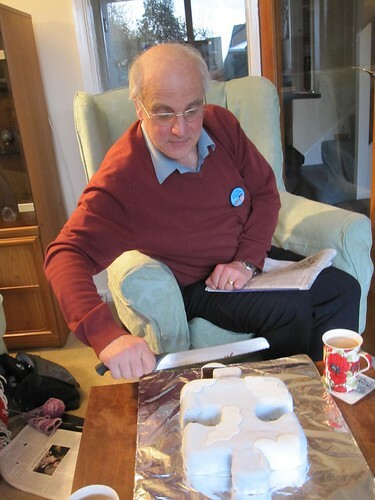 My Dad loves jigsaw puzzles – the more difficult the better – so I decided to make a piece of sky. I coloured most of a box of sugarpaste sky blue, using food colouring paste, and rolled it out to cover the cake. It was pretty difficult to get the paste to fit neatly in the notches, and if you look closely you’ll see it’s a right dog’s dinner in there. In retrospect, I should have taken a bit more time and effort to mould it carefully into the spaces. I cut out clouds with the remaining white sugarpaste and attached them into place with a bit of water. Et voila! Following an adventurous journey involving two buses, a train, a rainstorm and a domestic argument, I made it home to my parents’ house with the cake intact. Happy birthday, Dad! 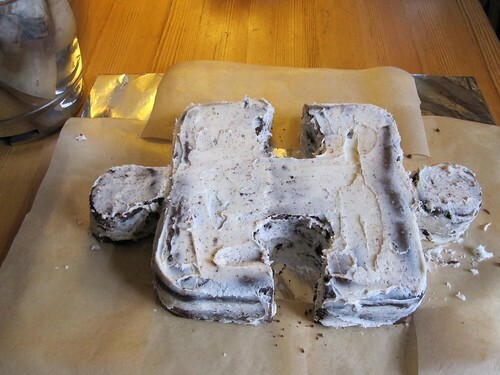 Makes one rather hefty 8 to 9 inch square cake. Ingredients should all be at room temperature before you start. Preheat the oven to 175C (350F, gas mark 4). Grease and line your tin of choice with baking paper. Cream the butter and sugar together until pale and fluffy. Beat in the choc/honey mixture, then the eggs. Sift together the flour, cocoa and baking powder. Stir in a third of this to the main wet mix, alternating with a third of the milk (with the vanilla extract added to it). 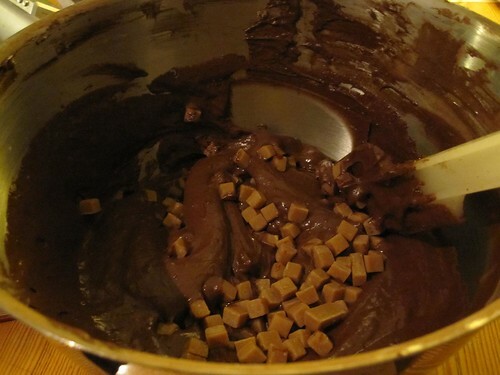 Stir in the fudge chunks. Flop the batter into the tin. Level the top and bake for about 45 mins, or until a skewer comes out clean. Heave it out carefully onto a rack to cool. Mine rose dramatically and cracked everywhere, but settled down to a lovely dense, moist, fudgey cake after cooling. 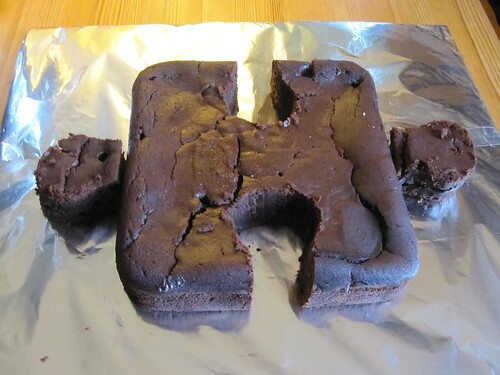 The fudge pieces melted into the cake, leaving some rather strange air pockets but making it really delicious in the process. Yay for musically inclined, baking, yarn addicted science junkies!